Motorized shoe cleaner for areas requiring dust-free conditions. It can be used with a microstatic filter vacuum system or the solenoid valve 103 for connecting into central vacuum system or the 7487 Vacuum Producer. 3 motor driven brushes clean sides and top surface and 1 bottom does sole and heel. (Top brush is optional). 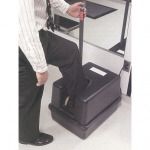 Rotating brushes powered by 1/4 HP electric motor, 110 v, 60 Hz, Control switch located on top of personnel support handle which assists the operator in maintaining balance. Cover is removable.